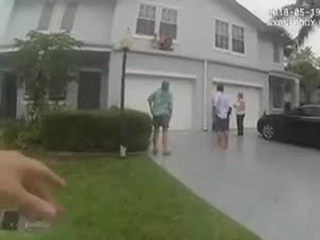 Delray Beach police officers responded to a call Saturday of a woman and children standing on a roof. When they got there, they say they found a 23-year-old woman who was hallucinating and two small children, ages one and three, on the garage ledge on a townhouse. Officer Rob Addea got under the window, ready to catch a child or the woman if necessary, police said. “Just get the kids back inside,” Addea said. Two other officers went upstairs and out a window to the ledge and one grabbed the children's arms while the other tried to reason with the woman, police said. "I was afraid she was going to jump or pull me with her or kick the children," said Officer Brian Griffith. "I had a grip on the kids, they were not going to fall off; they were kind of safe," added Sgt. Mike Debree. Police eventually were able to rescue all of them. "Anything with children as a first responder, with kids in the mix, you are in a new gear; you have to fight every instinct, normal instinct to run out there yelling and screaming. What are you doing get these children off the roof? said Addea. Body camera video recorded the actions of the officers. "We had to mentally prepare for the worst and hope that things would work out and luckily they did," Addea said. The woman has been committed to a mental health facility under the Baker Act and might face criminal charges, police said. The Florida Department of Children and Families is investigating and the children are in their custody.